Producers have been encouraged to use cover crops for decades, but cover crops have had a hard time taking off. 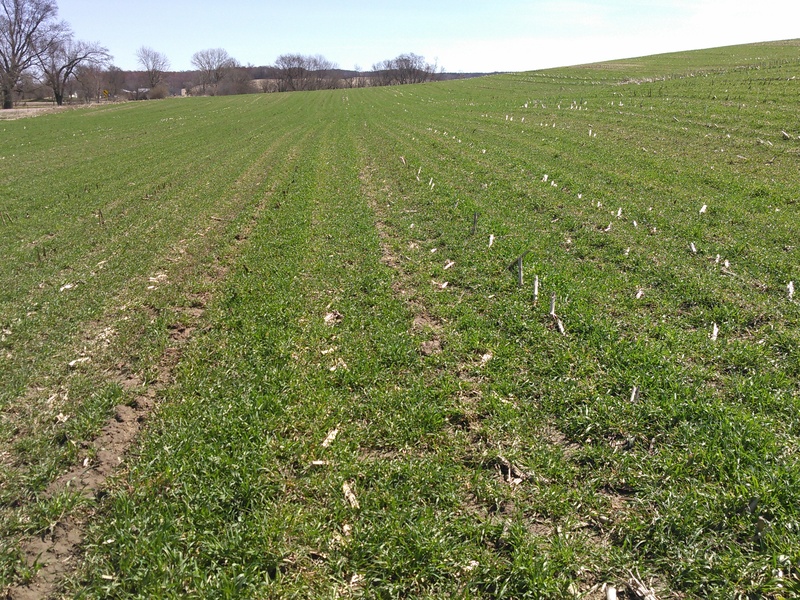 The limited adoption of cover crops has a lot to do with the small window of time to plant and establish small grain covers after corn or beans. Something seems different now. More farmers are sincerely interested; and they are willing to think outside of the traditional cover crop box of waiting until harvest is over, then spreading manure, then tilling, and then planting winter rye with a grain drill. Farmers in the Elk Creek Watershed south of Osseo, WI, want to figure out how to use cover crops after their primary corn and bean harvest. They hope cover crops can help reduce soil erosion on their hilly landscapes. They are also interested in how cover crops contribute to nutrient cycling and soil health. Seven area farmers are part of a farmer-led watershed project focused on evaluating different cover crop establishment methods and comparing notes to see what works well. Through this project, last fall cover crops were established on 16 fields on seven farms after corn silage, soybeans, and corn grain. Establishment methods included broadcast spread only, broadcast spread with vertical tillage afterwards, and no-till drill planting. Manure management within the fields included manure pre-rye planting, fall injected manure post-rye emergence, fall broadcast manure post-rye emergence, and broadcast manure through the winter. Winter rye was planted on 13 fields, two fields had a multi-species mix of rye, crimson clover and radish, and one field was planted to oats. Results from these cover crop evaluations show that earlier planting dates positively influenced ground cover and dry matter yield. All plantings done in September, after corn silage, were more robust compared to plantings in October and November after soybeans or corn grain. This followed through into the spring, as well. Table 1 shows that fields with greater than 30% spring canopy cover had 2.5 times more above ground biomass than the fields with less ground cover. All but one field from within the greater than 30% spring canopy cover group were planted in September after corn silage. Conversely, for the fields with less than 30% canopy cover, all but one field was planted in October or November after soybeans; the other field within this category was planted in late October after corn grain. Note, this is a snapshot in time, approximately one week before spring termination; each field continued to grow cover crop material, and yields were ultimately higher upon rotation. Through this project, seven neighboring farmers are sharing their cover crop establishment experiences. We saw that early plantings of winter rye in September, after corn silage, provided the most ground cover in fall, as well as through the next spring. After corn silage, broadcast seeding of rye was quick, easy, and worked well. After cover fields have emerged 3-5 inches they were resilient enough to receive broadcast and injected manure. Some cover was diminished with applied manure, yet it was surprising how well the rye bounced back and remained functional. Regarding the later plantings, every field grew and provided spring cover; none were failures. As the 2016 fall season advanced, farmers who ensured a better seed to soil contact (no till drill or broadcast + vertical tillage) had more ground cover in the fall and spring compared to those who just broadcast rye seed. Yet, all the rye that was broadcast grew on fields after bean harvest. Our field set included one corn grain field that had winter rye broadcast spread with an immediate vertical tillage pass that grew nicely; and one no-till drilling of rye into beans with zero emergence last December that also turned out to have very adequate spring cover growth.